The overall economy slowed at the start of 2014, which took a toll on housing and economic activity. According to the Bureau of Economic of Analysis, real GDP contracted at a 1% seasonally adjusted annual rate during the first quarter. Growth would have been slightly positive absent a decline in business inventory investment. However, this drawdown sets the stage for more stable growth for the rest of 2014. An example of improved economic news from the second quarter was the May employment report. According to the Bureau of Labor Statistics, payroll employment improved by 217,000 for the month. In fact, the month of May was the first time that total employment (138.365 million) surpassed the prior pre-recession peak. Of course, given population growth, the economy continues to suffer from a lack of jobs, which in turn is holding back housing demand. Home builders and remodelers have added 106,000 jobs in the last 12 months. The seasonally adjusted construction sector unemployment rate now stands at 8.9%, down from 11.2% a year ago and 22% at the post-recession peak. Labor data from April indicate that the number of open construction sector jobs, which has been elevated for the last two years as construction expanded, has declined over the start of 2014 to a count of 94,000. Nonetheless, the open rate remains higher than any period prior to 2013. In addition to labor shortages, an important industry headwind remains the lack of building lots. A recent NAHB survey indicates that 59% of builders report low or very low lot supplies in their market. This is the highest rate of “low” responses since the question was first posed in 1997 and is notable given that housing starts remain below normal levels of market production. NAHB surveys continue to suggest relatively tighter conditions for land acquisition and development loans (in contrast to construction loans) used to finance lot development, although recent FDIC data suggests that lending is increasing. For example, over the last four quarters the stock of residential AD&C loans has increased by 12%. Overall, the housing market continues to improve, but progress is slow going. The NAHB/First American Leading Markets Index remained at .88 for the nation from May to June but was up 6 points from .82 in June 2013. The index measures progress back to and beyond normal economic and housing markets for 351 metropolitan areas. Three of 10 metros did see a monthly increase in their individual indexes and 83% have seen an increase in the past year. Markets already past their last level of normal are concentrated in energy-producing markets and were more stable. At the other end of the spectrum, markets still only two-thirds of the way back to normal are the industrial Midwest or in the sand states most harmed by the boom and bust. Their slow progress is primarily the result of the slow single-family housing market. Single-family housing permits are only at 43% of their last normal market in the early 2000s. Recent Federal Reserve data also reflect the progress in housing in recent years. According to the Flow of Funds data, home owner equity has reached a level last experienced in 2007. In the last quarter, home owner equity grew by $795 billion. Despite low interest rates, housing demand has lagged in 2014. For example, the National Association of Realtors Pending Home Sales Index is down 9% on a year-over-year basis. However, new home sales have fared better than existing home sales in recent months. According to the Federal Housing Finance Agency, the average effective interest rate on new home sales was 4.33% in April. Construction spending grew in April by a slight 0.1%. Single-family spending was up 1.3%, and multifamily increased 2.7% month over month. The relatively strong performance by the multifamily sector is consistent with the most recent NAHB Multifamily Production Index, which increased three points to 53 during the first quarter. This marks the ninth consecutive quarter of a reading above 50. Readings above a level of 50 indicate that more respondents report improving conditions than don’t. Market absorption data for rental and for-sale multifamily remained strong at the start of 2014 as well. In analysis news, NAHB economists recently published membership census data investigating the characteristics of builder members. And a new tool was made available that allows access to the latest Census data by geographic areas that are consistent with local home builder association jurisdictions or market area. Housing data for April offered positive news as the traditional spring housing season began with the pace of home building and new home sales increasing for the month. The monthly rate of housing construction starts exceeded 1 million for first time since last year and housing permits were over 1 million for a third consecutive month. However, the monthly increases were almost entirely in multifamily rental construction. Single-family starts increased 5,000 on a seasonally adjusted annual basis to 649,000 from an upwardly revised March of 635,000. Multifamily construction soared 40% to an annual rate of 423,000 starts, the highest since January 2006. Multifamily starts were particularly strong in the Midwest, where the pace more than doubled perhaps due to weather effects. Rental demand remains strong. Recent consumer price data, for example, indicate that inflation adjusted housing rents are up 1.2% year over year. The pace of new single-family home sales increased 6.4% in April to a seasonally adjusted annual rate of 433,000, virtually matching the first quarter average of 434,000. The 26,000 monthly increase was entirely due to a 27,000 jump in sales in the Midwest region. However, this increase was not outside the survey’s regional confidence interval. A positive component of the April new home sales report was a continued increase in inventory, now up to 192,000 homes for sale from a low of 142,000 in July 2012. Builders continue to experience supply-chain difficulties, but the slow increase in inventory indicates some ability to expand construction. Existing home sales increased 1.3% in April but was down 6.8% from the same period a year ago. The National Association of Realtors (NAR) reported April 2014 total existing home sales at a seasonally adjusted rate of 4.65 million units combined for single-family homes, townhouses, condominiums and co-ops, up from 4.59 million units in March. Total housing inventory jumped 16.8% in April to 2.29 million existing homes due to typical seasonal patterns. First-time buyers continue to display weakness in the existing home sales market, comprising 29% of April 2014 sales, down from 30% in March and unchanged from last April. The January first-time buyer share of 26% was the lowest since NAR began reporting that share monthly in October 2008. Data for the first quarter of 2014 provide additional detail concerning the home construction market. Total townhouse construction declined on a year-over-year basis in the first quarter due in part to first-time buyer weaknesses. According to NAHB analysis of Census data, single-family attached starts totaled 13,000 for the quarter, compared to 15,000 during the first quarter of 2013. Over the last four quarters, townhouse construction starts totaled 66,000, down from the 72,000 total for the four quarters prior to this period. The market share of homes built on an owner’s land, with either the owner or a builder acting as the general contractor, was effectively unchanged on a quarter-over-quarter basis at the start of 2014. NAHB’s analysis of Census data indicates that the number of starts of this type of building rose from 25,000 at the start of 2013 to 27,000 for the first quarter of 2014. The average size of newly built single-family homes increased during the first quarter of 2014, with much of this ongoing multiyear trend of increasing size likely due to the greater proportion of move-up and higher income new home buyers. According to first-quarter 2014 data from the Census and NAHB analysis, average single-family floor area increased from 2,656 to 2,736 square feet, while the median rose from 2,465 to 2,483. Since cycle lows and on a three-month moving average basis, the average size of new single-family homes has increased 13% to 2,685 square feet, while the median size has increased more than 17% to 2,471 square feet. While multifamily construction continues to expand due to rising rental demand, single-family starts built for rent were effectively unchanged at 4,000 starts for the first quarter of 2014. The market share of built-for-rent single-family remains elevated, but the share and count of starts appear to be declining off post-Great Recession highs, with the market share, as measured on a one-year moving average, standing at 3.3% for the first quarter of 2014. This is higher than the historical average of 2.8% but is down from the 5.8% registered a year ago. After rising during the boom years and falling during the Great Recession, the average size of newly built, multifamily units remains close to levels seen a decade ago due to lack of typically larger condo construction. According to fourth quarter data from the Census Bureau and NAHB analysis, the average unit size for multifamily housing construction starts was 1,182 square feet. The median was 1,023. These current estimates are very close to the typical data from the 2001-2003 period. As National Home Remodeling Month in May ends, NAHB continues to publish data and analysis concerning home improvement trends. This includes estimates of spending on improvements to owner-occupied housing by ZIP code. On average, total spending on improvements in a ZIP code is projected to be about $5.1 million in 2014. The top five total-spending ZIP codes are all in Maryland, Texas, or Illinois. Each of these top five areas contains at least 15,000 owner-occupied homes and home owners who average at least $145,000 in income and are 60% or more college educated. NAHB survey data recently revealed the leading green products used by remodelers. Nearly 9 out of 10 remodelers surveyed said they commonly used low-e windows during the past year. Next on the list were high efficiency HVAC systems and programmable thermostats at 70% each, closely followed by ENERGY STAR appliances at 69%. Finally, industry survey data was published that examines consumer preferences when selecting an individual contractor for home improvement projects. “Reputation for quality construction” easily came in first, ranked most important by 45% of customers—over twice the “most important” percentage for any other attribute on the list. The survey also revealed that industry professional designations, such as NAHB Certified Graduate Remodeler and others, were important to home owners when selecting a service provider. While weather played a significant negative role on housing and the economy in recent months, certain residential construction industry headwinds moved in positive directions in April but remain key concerns. With respect to building materials, softwood lumber prices were down 4% in April from March and off 8.2% from a peak one year ago. OSB prices continue to tread water so far in 2014, declining 0.6% in April, after a sharp 2013 reversal of the steep run-up in prices in 2012. OSB prices remain 23.8% above their average level in 2011. Gypsum prices declined 3.7% in April, the second monthly decline, but remain 41.9% above their average 2011 level. Mortgage delinquency rates continue to decline. Data released by the Mortgage Bankers Association indicates that the delinquency rate for mortgage loans on one-to-four-unit residential properties, considered single-family properties, decreased to a not seasonally adjusted rate of 5.69% of all loans outstanding at the end of the first quarter of 2014, 106 basis points below the 6.75% delinquency rate recorded in the first quarter of 2013. This level represents the lowest level since the first quarter of 2008. And in other finance news, NAHB survey data suggests that lending conditions for acquisition, development and construction (AD&C) loans continue to ease but remain tight. In the first quarter of 2014, the overall net tightening index based on the AD&C survey improved from -25.5 to -30.8. The index is constructed so negative numbers indicate easing of credit; positive tightening, so a lower negative index means greater easing. Lastly in policy news, the Federal Reserve’s monetary policy committee turned its attention to the timing of its long-run intention to raise short-term interest rates. To avoid the adverse reaction experienced last spring during the speculation concerning the timing of quantitative easing tapering, the minutes included the phrases to communicate that the discussion was planning for the future. NAHB believes this moment will come during the summer of 2015. After a weak performance for the economy as a whole during the first quarter, spring is a time for improvements – for homes and the overall housing market. May is National Home Remodeling Month, and NAHB has useful data for remodelers who want to know why home owners are undertaking improvements, as well as the most common types. Among remodelers participating in an NAHB industry survey, bathroom remodeling was cited as the most common project, narrowly beating out kitchen remodeling. Window and door replacements, whole housing remodeling and room additions rounded out the top five. Data from the American Housing Survey indicate that home owners are most likely to use a professional remodeler for jobs involving HVAC systems and roofing followed by siding, windows/doors, electrical systems, plumbing and floors. According to the NAHB survey, the most common reasons for remodeling included a desire for better amenities, a need to replace or repair old components, and a need for additional space in the home. Home improvement spending has a direct economic benefit on the economy. New estimates from NAHB indicate that every $1 million in remodeling spending creates 8.9 jobs. These estimates also note that building 100 single-family homes creates 297 jobs, and developing 100 multifamily units generates 113 jobs. The role of housing investment as a job creator was highlighted by NAHB in testimony before the Senate Economic Policy Subcommittee hearing “Drivers of Job Creation.” That hearing involved a discussion of the transitions in the construction labor market as housing construction continues to recover. March data from the Bureau of Labor Statistics JOLTS survey reveal 104,000 unfilled construction sector jobs, as firms in some markets report challenges in filling vacant positions. Despite disappointing housing data at the start of 2014, the housing recovery continues. The NAHB/First American Leading Markets Index (LMI) rose one point in May to a level of 0.88. The LMI measures how close local markets are to normal conditions, based on reading of home prices, labor markets and housing construction permits. About one-quarter of all metro areas showed improvement from March to April on the LMI and 300 (85%) showed improved from May 2013. As of the first quarter 2014, housing’s share of GDP stood at 15.5%, with home building contributing three percentage points of that total. NAHB is forecasting solid growth in single-family starts and continued expansion of multifamily development for the year; thus, housing’s share of the economy should continue to grow. Residential construction spending in March posted a small increase but remains effectively unchanged over the course of 2014 thus far. The current pace of home construction spending ($369.8 billion on a seasonally adjusted annual basis) is 0.8% over February and 16% higher than a year ago. From March 2013, on a three-month average basis, single-family construction spending has increased by 16.3%, multifamily is up by 30.8%, and remodeling has grown by 12.8%. The NAHB single-family 55+ survey reported the most positive first quarter market conditions for senior housing development in its history. Compared to the first quarter of 2013, the single-family index increased four points to a level of 50, which is the highest first-quarter reading since the inception of the index in 2008 and the 10th consecutive quarter of year –over- year improvements. There are many factors contributing to the positive signs in the 55+ housing market, including rising house prices and low interest rates that are helping baby boomers sell their current homes at a favorable price and in turn, purchase a new home more suited to their preferred lifestyles. Recent declines in housing affordability remain an industry headwind as the housing sector meets the traditional spring selling season. Home prices continue to rise, with the S&P/Case Shiller 20-City Index up 0.8% in February and gaining 12.9% over the prior 12 months. For the overall housing market, data from the Federal Reserve’s Senior Loan Offer Opinion Survey suggest that demand for mortgages weakened during the first quarter, with many regional banks reporting tightened lending standards. Nonetheless, housing affordability conditions remain positive by historical standards. 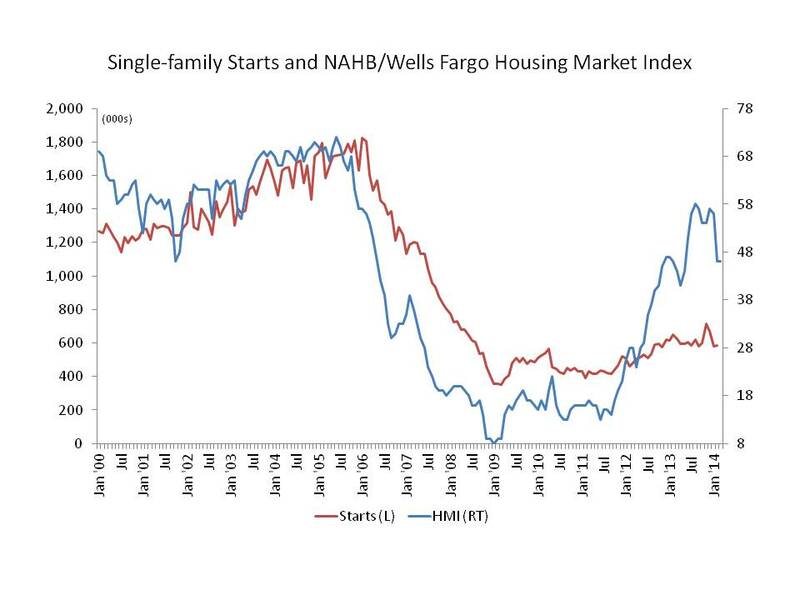 The NAHB/Wells Fargo Housing Opportunity Index ticked up during the first quarter of 2014. Per the HOI, 65.5% of all homes sold between the beginning of January and end of March were affordable to families earning the U.S. median income of $63,900. In macroeconomic news, GDP growth in the first quarter was a disappointing 0.1% gain, with downward revisions expected. Weather impacts took a toll on investment components, including home building during the start of the year. However, personal consumption expenditures remained solid, growing 3%. The April employment report brought relatively positive news, with 288,000 net jobs created for the month. The unemployment rate fell from 6.7% to 6.3%, although that decline was due to large 806,000 decline in the number of people in the labor force. Finally in analysis news, NAHB followed up prior examinations of local housing markets using Census data. The most recent study tracked the top markets for changes in single-family and multifamily market shares. Among the findings: Areas with the largest gains in single-family market concentration tended to have above- average population growth. Top markets using this measure included Fairbanks (Alaska), St. George (Utah), Yuma (Ariz.), and Yakima (Wash.). With the unseasonably cold winter now finally over, the spring home building and selling season has begun. Economic data thus far presents mixed news. For example, new home sales disappointed for the month of March. The U.S. Census Bureau and the Department of Housing and Urban Development reported that March new home sales were down 14.5% in March to a seasonally-adjusted annual basis of 384,000, the lowest pace since July 2013 and down 13.3% year-over-year. Nonetheless, despite significant headwinds first quarter home sales numbers were only slightly lower than NAHB’s forecast: 434,000 annualized average pace of sales versus a 438,000 forecast. And as detailed at NAHB’s bi-annual Construction Forecast Webinar, NAHB expects the housing recovery to continue on improved economic trends. Existing home sales decreased 0.2% in March, according to the National Association of Realtors (NAR). However, the level of activity was down 7.5% from March 2013. Potential reasons for this year-over-year decline is the fall in distressed sales (down from 21% to 14% of the market year-over-year) and ongoing weakness in demand among first-time home buyers. The current share of first-time home buyers is 28%, compared to a historical average of about 40%. A positive future note was found in the NAR Pending Home Sales Index for March, which increased 3.4%. While the index remains 7.9% lower year-over-year, the bump up in pending existing home sales contracts is a hopeful sign for the spring selling season. Among positive factors for the short-term for housing are ongoing historically low mortgage interest rates. For example, data from the Federal Housing Finance Agency (FHFA) indicate that the average contract interest rate on conventional mortgages was 4.21% in March. This is higher than rates experienced for the first half of 2013 but remains low by historical standards. On the other hand, affordability has been challenged by rising home prices. The FHFA Housing Price Index has risen by 15% over the last 25 months. Another indicator reflecting lingering winter effects is the NAHB Remodeling Market Index (RMI). The RMI declined from 57 to 53 for the first quarter of 2014. While still above the key level of 50, the economic impact of the winter likely affected the RMI at the start of the year. A persistent headwind for the residential construction sector has been access to credit. Recent Federal Deposit Insurance Corp. (FDIC) data and NAHB industry surveys suggest that credit conditions for acquisition, development and construction (AD&C) loans are improving slightly, but a lending gap remains. With this in mind, a recent NAHB analysis examined the most common sources of AD&C lending for home builders. The analysis found that 62% of home building AD&C was held by community banks – financial institutions with less than $10 billion in assets. This concentration among smaller banks was lower prior to the Great Recession. In other analysis news, NAHB economists used the American Community Survey to contrast income, age and household size characteristics among renters and owners. Not surprisingly, the numbers reveal that home owners tend to be older, have higher income and reside in larger households. For example, the average household income of a homeowning married couple with children was just over $98,000 in 2012. A separate analysis examined car ownership by home owner/renter status, including geographic differences across markets. Finally, as April marked New Homes month, NAHB updated an analysis contrasting maintenance, utility and other housing costs between owners of new construction and other homes. The data reveal that new homes are less costly to maintain, insure, and operate on a per square foot basis than other owner-occupied homes. An unseasonably cold winter took its toll on economic activity at the start of 2014, causing many key market measures to fall short of initial forecasts. For example, first quarter GDP growth will likely prove to have been less than 1%. However, as winter turns to spring, we can expect a rebound as consumers undertake activities that may have been deferred at the start of the year. Consistent with this situation, the NAHB/Wells Fargo Housing Market Index (HMI) was effectively flat in April, rising one point from a downwardly revised March level. At 47, the HMI has now been below the key level of 50 for three consecutive months. The essentially unchanged index is the result of builders waiting on expected spring demand while holding any further optimism until actual sales occur. Many of the individual comments mentioned stronger traffic or more serious buyers, but the interest has yet turned into contract signings. Builders continue to meet some supply constraints as buildable lot supply either is not available or is priced beyond what the builder feels can be recaptured in a sale. Housing starts for the month of March, as reported by the Census and HUD, indicated a 2.8% increase from the upwardly revised February numbers. On a seasonally adjusted annual basis, total single-family starts rose 6% to a 635,000 annual rate. The increase was particularly strong in the Northeast and Midwest, where building was down during recent winter months. Builder hiring increased in March. According to data from the Bureau of Labor Statistics (BLS), the residential construction sector added 9,100 jobs on a seasonally adjusted basis in March. Total industry employment now stands at 2.242 million. And over the last 12 months, builders and remodelers have created 103,000 jobs. Worker shortages remain an issue in some markets. However, the count of unfilled construction-sector jobs fell at the start of 2014. As of February, data from the BLS JOLTS survey indicate there were 120,000 open positions at construction firms, down from 165,000 in November. Nonetheless, the February open rate (2%), as measured as a percent of total industry employment, remained the fifth-highest mark since the recession ended. The general improvement for housing markets can be tracked using the NAHB/First American Leading Market Index (LMI). The index, which measures how close markets are to their normal levels of activity, increased from 0.87 to 0.88 in April. The index measures single-family permits, home prices and employment in the past 12 months and divides that by the last normal annual level. For permits and prices, the last normal period is 2000-2003 and for employment 2007. The LMI has been moving steadily upward for two years from a low of .78 in April 2012. At the same time, the number of markets at or above their last normal level of activity increased from 34, with 19 in energy-producing states, to 59, with 30 in energy-producing states (Texas, Louisiana, Montana, North Dakota, Oklahoma and Wyoming). The slight broadening into states with other economic bases is consistent with broader economic growth in the U.S.
March BLS producer price data signals building material cost concerns as the housing recovery continues. Gypsum prices were effectively flat in March (0.9% decline), after a significant increase at the start of the year — the third year in a row of such prices increases. Gypsum prices are up 9.5% year over year. Softwood lumber products increased 1.7% in March, while OSB prices were effectively flat. Over the past 12 months, prices on consumer expenditures increased 1.5%. Consumer prices increased in March by 0.2% on a seasonally adjusted month-over-month basis. The real rent index increased in March by 0.1% month over month and 1.2% for the year. In analysis news, NAHB economists continued their look at home buyer preferences. The last review found that buyers of all backgrounds possess strong preferences for energy-efficient products. Using IRS and Census data, economists examined the rising – although still small – market share of individuals who work at home, which represents a potential market opportunity for builders and remodelers. The data indicate clear geographic clustering of home office use among states and industries. Finally, wrapping up NAHB’s ranking of metropolitan housing markets, American Community Survey data indicate the top markets in terms of share for new construction, home values and median income. In many parts of the country, spring began with winter-like conditions persisting. Without a doubt, unseasonably cold temperatures reduced economic activity during the first quarter of 2014, including home sales and construction. However, housing demand also weakened due to recent changes on the demand side of the market. Such changes can be seen in the contrasting data concerning new and existing home sales. New home sales remained effectively flat for the first two months of the year. According to the Census Bureau and HUD, new home sales declined 3.3% in February, yet the January-February average sales pace was approximately the same as the fourth-quarter 2013 seasonally adjusted annual rate of 447,000. New home inventories are rising in anticipation of a better spring, up 3,000 homes in February compared to December. In contrast to new homes, existing home sales experienced a significant decline in recent months. 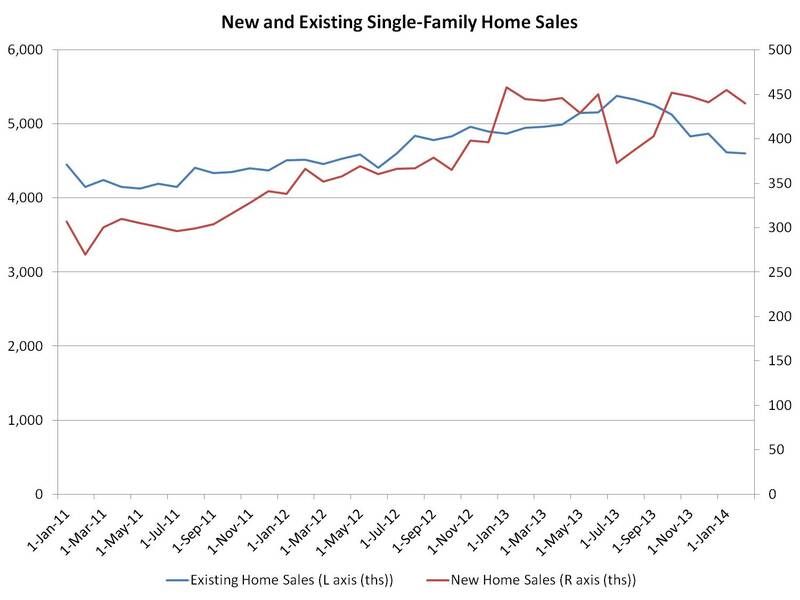 Since July 2013, the pace of new home sales increased 18%, while existing single-family home sales declined 15%. February existing home sales, according to the National Association of Realtors (NAR), were down 0.4% for the month and off 7.1% from a year ago. Aside from weather factors, part of the recent decline is due to a slackening of volume in distressed sales, which are off from 25% of the market a year ago to 16% in February. All-cash sales continue to play a dominant role in the existing home market (35% of transactions), while the first-time home buyer share rose from 26% in January to 28% in February. This weakness in existing home sales can be expected to continue. The NAR Pending Home Sales Index — a useful indicator of future sales volume — decreased 0.8% in February, marking eight straight months of decline. Despite these declines, home prices are rising, albeit at a slowing rate. For example, January’s Case-Shiller 20-city index showed a 0.8% monthly increase, marking the 23rd monthly increase. Consumer confidence indicators continue to show high levels of interest in purchasing a new home, although overall levels of sentiment have been mixed due in part to recent weather impacts. The softness in recent housing data also appeared in construction spending data from the Census Bureau. Total private residential construction spending declined in February after three consecutive months of increase. The reading was down 0.8% from January, but still 13.5% higher than a year ago. Month-over-month single-family spending decreased by 1.1%, while the home improvement category decreased by 1.3%. Multifamily construction rebounded from a drop in January with a strong month-over-month increase of 2.6%. In analysis news, NAHB continued its review of home buyer preferences, with new survey data indicating ethnic differences in preferences for items like kitchens and bathrooms. And NAHB economists used American Community Survey data to track the top metro areas by single-family housing market share and lowest home owner vacancy rates. In tax analysis, NAHB reported that property taxes continue to be the primary revenue source for state and local governments. And new IRS data shows that the volume of remodeling activity generated by the 25C tax credit experienced a significant drop after 2010 policy changes.